Promotional value expires 90 days after purchase. Amount paid never expires. Not valid until 06/01/2018. Tax not included. Limit 1 per person. Limit 1 per visit. Valid only for option purchased. Valid only at listed locations. Merchant is solely responsible to purchasers for the care and quality of the advertised goods and services. After a trip to Hawaii, husband and wife Steve and Camy brought back an unusual souvenir: a craving for poké so strong that they opened their own restaurant devoted to it. 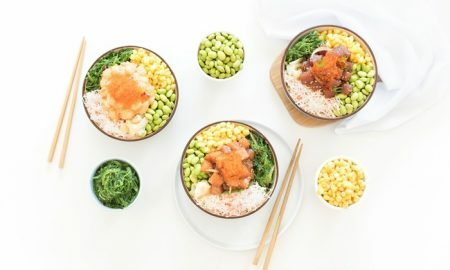 The menu at Steve’s Poké Bar is inspired by its namesake dish—which tops rice quinoa or salad with scoops of raw salmon, ahi tuna, whole scallops, or cooked tofu. Bowls can be customized with over 15 unlimited free toppings and 4 premium toppings.